In his remarks at a 1962 dinner honoring Nobel Prize winners, President John F. Kennedy famously said that he believed the assemblage before him to be ‘the most extraordinary collection of talent, of human knowledge, that has ever been gathered together at the White House, with the possible exception of when Thomas Jefferson dined alone.’ In the exalted history of choral music, increasingly marginalized by today’s secular society, one can seek parallels for Kennedy’s characterization in the choir gallery of the Cappella Sistina, where Josquin des Prez refined his craft, or England’s Chapel Royal, where in his brief life Pelham Humfrey defined Restoration choral traditions. There is in the congress of composer, text, and the art of writing for massed voices a power that is unique in music, an energy that pulses through notes, words, and voices with a directness that can be neither duplicated nor diminished. It is this creative electricity that charges through the strains of des Prez motets and Humfrey anthems—and through every bar of American composer Emerson Eads’s Mass for the Oppressed. President Kennedy understood the isolation of inspiration, but he also knew that one can transcend one’s own society only by embracing and fully participating in it, enduring tragedies with hope for triumphs. In Mass for the Oppressed, Eads transforms reflections on inhumanity into sounds of great beauty not by commenting on misfortune but by communing with it. This is music that ignites emotional wildfires, fueled by the ingenuity of an artist who, like Jefferson, engages his world with a keen mind and uncommon depth of feeling. Distressingly, from innumerable atrocities inflicted upon Native Americans and the enslavement of African Americans to the internment camps to which Japanese Americans were exiled during World War Two, virtually every page of the history of the United States of America is stained with betrayals of the ideals of ‘life, liberty, and the pursuit of happiness’ upon which the cornerstones of modern American society were laid. Perhaps prejudice, divisiveness, and violence were to be expected of a nation conceived in hypocrisy, but the better nature of her people has prevailed so often that its failures are all the more sickening. The tragic 1997 murder of fifteen-year-old Alaskan John Hartman, a vicious crime in the investigation of which the victim suffered disdainful scrutiny of his life and the hours before his death, was followed by a gross miscarriage of justice in which four young men—George Frese, Kevin Pease, Marvin Roberts, and Eugene Vent—were convicted of and imprisoned in punishment for a crime they were all too readily believed to have committed. Their true crime was diversity: Alaska Natives and a Native American, this quartet looked as people of privilege felt—and persist in feeling—that criminals look. Founded in 2006, the Alaska Innocence Project was conceived with liberating the Fairbanks Four as its foremost initiative, but even their eventual exoneration was tainted by impropriety, the agreement via which their freedom was secured depriving them of the right to seek any form of compensation for the two decades stolen from them. Responding both to this travesty and to its resolution, Fairbanks native Eads created in his Mass for the Oppressed a work in which the humanistic profundity of the Ordinary of the Mass is heightened by contrasts with sensitive verses by the composer’s brother, Evan Eads, and excerpts from youthful writings of Pope Francis. Musically, the score’s predominant idiom is unabashedly tonal, but Eads employs harmony with boldness that proclaims the music’s modernity without piling on dissonances for the sake of feigning originality. Unafraid of memorable melodies, the composer achieves intoxicating density of sound with surprisingly transparent orchestrations. As exhibited in the performances of his imaginative settings of the Spiritual ‘He’s Got the Whole World in His Hands’ and ‘De Profundis’—the former beautifully and stirringly fronted by soprano Jaunelle Celaire and baritone Emorja Roberson and the latter by sopranos Victoria Fraser and Isabella Burns, contralto Gabriela Estephanie Solis, and tenor Matthew Kelly—that complement this recording of Mass for the Oppressed, Eads wields particular skill at constructing musical syntax with finished phrases, his melodic sensibility distinguished by a gripping and now rare linearity. Melodies have genuine beginnings and endings, and the currents of thematic development upon which they journey display affectionate familiarity with choral traditions extending from the Renaissance unto the Twenty-First Century. In Mass for the Oppressed, Eads’s shaping of choral passages recalls in some moments the intricacy of Vaughan Williams’s manipulations of the sixteen voices in the first version of his Serenade to Music and in others the Brobdingnagian contrasts of Mahler’s Second Symphony. The writing for solo violin, poignantly executed in this performance, is reminiscent of Beethoven’s music for the instrument in the Benedictus of his Missa solemnis. There are bars that reflect aspects of Brahms’s Deutsches Requiem and Hindemith’s When Lilacs Last in the Dooryard Bloom’d: A Requiem for those we love, and the music for the solo voices in Mass for the Oppressed unites bel canto with modernity in a manner reminiscent of the music of Jake Heggie. These glimpses of Eads’s absorption of the choral traditions that informed and inspired his work notwithstanding, it is the individuality of his compositional voice that sings most resoundingly in every bar of Mass for the Oppressed. There is an expressive purpose for every harmonic progression, and each phrase has its own internal logic that determines its function within the Mass as a whole. With Mass for the Oppressed, Eads makes bold statements not only about the rôles that music plays in spotlighting and soothing the wounds men inflict upon one another but also about his own rôle as one of the Twenty-First Century’s most prescient musical healers. From the opening bars of the thought-provoking Kyrie, the performance that Mass for the Oppressed receives from the University of Notre Dame’s Concordia Choir and Ritornello Orchestra and soloists soprano Tess Altiveros, mezzo-soprano Toby Newman, tenor Barry Banks, and bass-baritone David Miller is as awing as Alaska’s landscapes. The choristers’ singing evokes the grandeur of Denali, fluttering with the grace of a single snowflake and roaring with the cataclysmic might of an avalanche, and the instrumentalists’ playing shimmers like the Aurora Borealis. There is nothing more moving in Monteverdi’s Vespers, Bach’s Passions, Mozart’s Requiem, or Elgar’s oratorios than the heartbreaking sincerity with which Eads’s music asks the listener, ‘Is there no help for the widow’s son?’ Voices and instruments intertwine with unforced fluidity. Here, the statements of ‘Kyrie eleison’ are not supplicants’ pleas for mercy: rather, these are the demands of the abused. The voices of the oppressed are lifted in song by the soloists. The duet for the male soloists is some of the finest music in the score, and Banks and Miller sing it with lustrous tone and verbal clarity. Whether singing in Latin or English, choristers and soloists focus as intently on elocution as on intonation, their delivery of words propelling their rhythmic precision. It is significant that Eads devised the Gloria in three scenes, meaningfully codifying the dramatic impetus of both music and text. In the first scene, ‘Paul and Silas in Prison,’ it quickly becomes apparent that glory celebrated brings recognition of glory denied, and a Job-like questioning of the validity of Providential prerogative in a world pockmarked by suffering and inequality is enacted in music of disquieting simplicity. It is not with the mind of a theologian but with the heart of an ordinary man that the cascading vocal lines ponder understanding and reconciliation. In the liturgical Gloria of the second scene, the music again conveys rejoicing and reluctance, the hesitation to extol divine magnanimity like an ostinato that pulses within the composer’s part writing. ‘Domine Fili unigenite’ is set as a pavane of impassioned elegance that Ravel might have borrowed from Rameau, and Altiveros scales its heights with security and haunting, ethereal sound. The third scene, founded upon a theme of ‘Remember Me!’ that conjures the atmosphere of the dying lament of Purcell’s Dido, partially resolves the ambivalence of the Gloria with a beguilingly uncomplicated conceit: to glorify the eternal is to claim a share of immortality. Whenever the soloists sing in the Mass, their voices face daunting technical challenges, universally met with preparedness and charisma. With music ranging in stylistic ancestry from Bach’s Evangelists to Loge in Wagner’s Das Rheingold and the tenor solos in Tippett’s A Child of Our Time, Banks is gruelingly tested: the quality of the performance as a whole is markedly enhanced by the splendors of his singing. As in the Gloria, Eads turns the simple faith of the Credo on its head, his setting of ‘I Wish to Believe’ throbbing with painfully direct uncertainty, the honesty of the text’s sentiments highlighted by the uncanny intelligence of the composer’s writing for the orchestra. 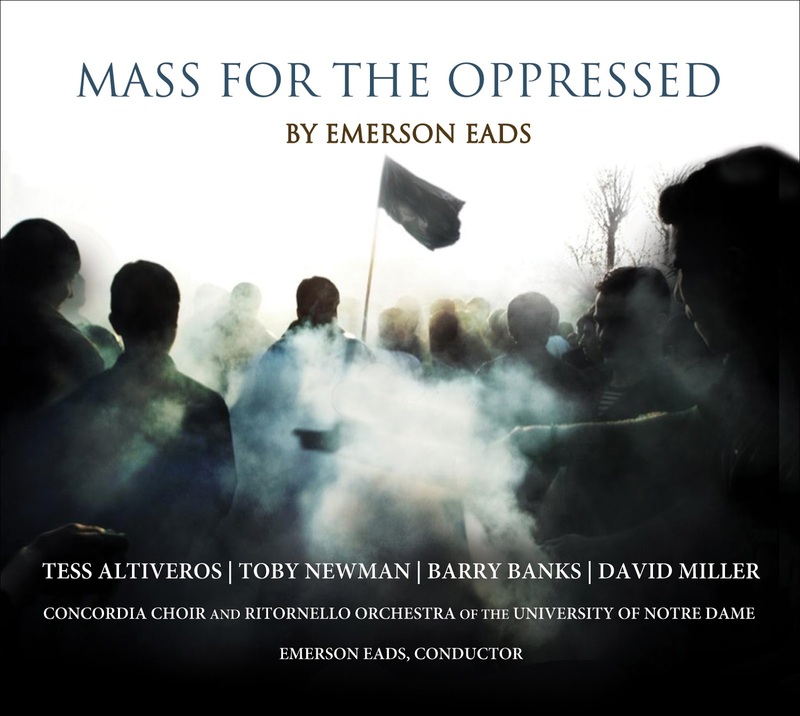 Rarely in recent years have new choral compositions demonstrated handling of the symbiotic relationships among words and music as adroit as Eads’s in Mass for the Oppressed. ‘Holy, Holy, Holy Lord God of Hosts’ in the Sanctus is equally effective in this regard, the music seeming to emerge from rather than merely accompanying the words. Like the spurious but electrifying top Cs in Allegri’s ‘Miserere mei,’ the meandering melodic lines in ‘Echoing King’ immediately carve their likenesses into the listener’s memory, soaring to striking heights of expressivity without affectation. Eads shares with Poulenc an ability to accurately judge the musical needs of a word, a phrase, or a feeling: like the other sequences of the Mass, neither the Credo nor the Sanctus contains a superfluous note or rest. It is in the final movement of the Mass, the Agnus Dei, that the narrative that Eads has relayed throughout the work is most ambivalent. At the core of Mass for the Oppressed is a quest for expiation of the sins of the world, not by the intercession of a symbolic Lamb of God but by the errant lambs of the flock. Catharsis might seem to be at hand, but this ‘Dona nobis pacem’ is no passive philosophical exercise in seeking, receiving, and accepting an external gift of peace. This is music of hewing one’s own peace from unforgiving circumstances, and Eads demands and in this performance receives resilience from all of the musical personnel. The composer’s conducting is nowhere more impressive than in the score’s final pages, in which the excruciatingly slow pace of the Fairbanks Four’s path to freedom figuratively accelerates with the momentum of truth. In every minute of this performance, the choir’s singing is heroic, at once intimate and intimidating. Eads tells the Fairbanks Four’s story with the effectiveness of a great novelist whose language is music, but the performance on this disc confirms that Mass for the Oppressed is not an occasional work. Exasperatingly, oppression is a seemingly ineradicable human condition, and the moral essence of Eads’s music is unmistakably universal. Little more than eighteenth months after he fêted Nobel Prize recipients at the White House, President Kennedy was dead, his life ended by an act of calculated evil and cowardice that even now lacks fully credible explanation. His assassination was a manifestation of the now-all-too-common disconnect between espousal of a cause and respect for the sanctity of human life, a disconnect that in different ways claimed the lives of five young men in Fairbanks in 1997. A disconnect no less troubling can be observed in the reality that many of the people who lament the death of President Kennedy would likely deem neither the plight of the Fairbanks Four nor the life of the youth they were falsely convicted of murdering worthy of remembrance. Great is the boon to music but still greater are the rewards for mankind that Emerson Eads disagrees.